Hi friends!Vermicelli kheer /Seviya kheer, is one of the traditional dishes of India. It is made in every Indian household for special occasions like Eid, Rakhsha Bandhan or as a dessert throughout the year. In North India it is called Vermicelli / Semiya / Seviya kheer and in south India it is called semiya Payasam.This delicious dessert can be served either warm or chilled. Fry Cashew nuts lightly in ghee in a non-stick pan. Add cashew nuts and raisins, keep aside. In the pan, take vermicelli and stir fry till light golden. Keep aside. Boil the milk in a deep heavy bottom pan. On slow fire let the milk boil and thicken , when 60% milk is left add fried vermicelli, mix well and cook on low heat for ten minutes. Add sugar and saffron, cardamom powder, fried cashew nuts and raisins. Mix well and cook on low heat for five minutes. Switch off the stove. 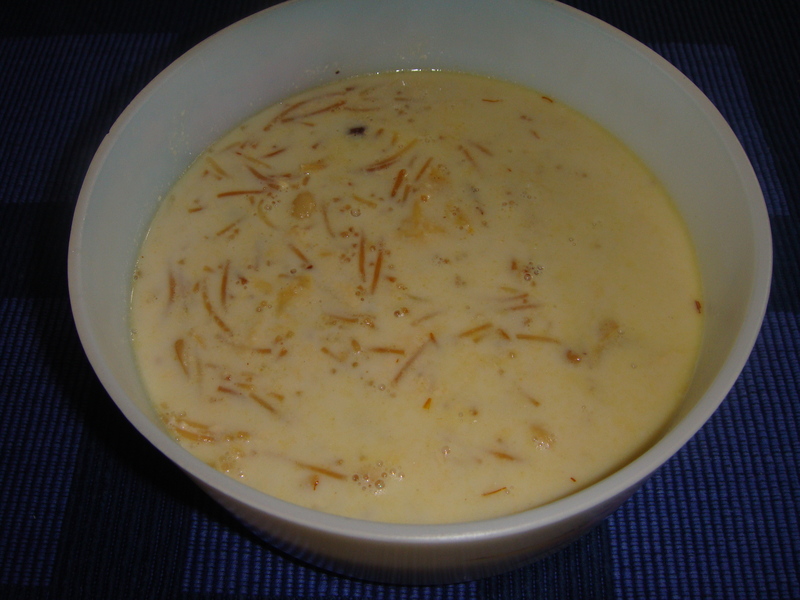 Note: Vermicelli / Seviyan Kheer/Semiya Payasam is a low Calorie Indian Dessert.